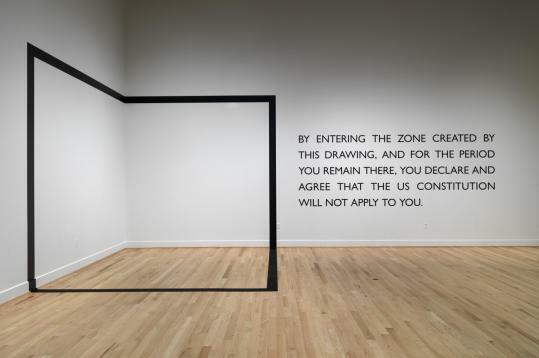 PROVIDENCE - “Declared Void,’’ the centerpiece of Carey Young’s exhibit “Uncertain Contracts’’ at the Museum of Art at Rhode Island School of Design, taunts the viewer like a line in the sand. This line, drawn in bold, black vinyl, describes the shape of a huge box over floor and walls in one corner of the gallery. Do you step inside? It’s a quandary. On the one hand, the space begs to be invaded. On the other, there’s that unwritten rule about not touching art in a museum. Not that this would exactly be touching. Still, the boundary feels inviolable, and yet begs to be violated. I made a beeline for the box, and stepped triumphantly inside. When I turned and reread the text, I felt, quite suddenly, alone and afraid. I sheepishly exited the box as quickly as I’d entered. Oh, the mind games some conceptual artists play! Young, a British artist on the rise, investigates how corporate and legal cultures shape society at large. Her frosty, incisive wit slyly undermines ideas and structures that many tend to take for granted. I trust that the US Constitution applies to me. Yet that wall text frightened me out of the box. “Declared Void,’’ made in 2005, is a metaphor for Guantanamo, Young notes in the show’s brochure. Specifically, the way detainees there were treated under the Bush administration, when, among other things, the Justice Department suggested that the detention camp could be seen as outside US legal jurisdiction. The Constitution is more slippery than we think, and Young conveys that point powerfully, in this piece that, by the way, is also an unabashed tribute to Sol LeWitt, the godfather of wall drawings and conceptual artists. Young’s “Plato Contract,’’ a text piece, declares itself not to be an artwork until it is displayed within the Plato Crater on the moon. Yet here it is, hanging in a museum - not a work of art? It’s a shifty collision of expectations and legalese, deliberately leaving us in the dark. Then there’s a photograph reprising “Parallel Stress,’’ a 1970 performance art piece by Dennis Oppenheim, who placed his body uncomfortably in industrial landscapes. He suspended himself by his hands and feet between two walls above a collapsed pier, and he lay belly down in a pebbly pit. Young reenacts the latter, lying in a business suit face down in a shallow pit; the backdrop is Dubai, with its fast growing high-rises built for Western corporations. Young, deflated in her black suit, looks as if she has been sucked into the monster of corporate greed, then spit out and left for dead. Young’s comic video “Uncertain Contract’’ features an actor in a white void reading words from a contract. He embodies each word with as many different meanings as he can muster, illustrating that even carefully precise language is open to interpretation. This piece, too, references early conceptual art, videos by Bruce Nauman and Vito Acconci. The work of those artists was existential, about the body in space and time; Young, in a more stylized, slick, and technologically-advanced manner, probes narrower questions that are no less meaty, about who we are in a world built by corporations and lawyers. Avish Khebrehzadeh, an Iranian-born artist who lives in Washington, D.C., and Rome, has a show of videos at the RISD Museum that are anything but slick. These simple, hand-drawn animations, backed by mournful soundtracks, refer to her childhood in Tehran, and to works by Iranian writers. Several come across as allegories, the underlying message of which is life, hard as it is, goes on. The video “Backyard’’ projects over Khebrehzadeh’s large drawing of a deer framed by lush plants, with a wall and a hexagonal structure topped with potted plants in the background. The drawing is as spare and evocative as the video, which portrays in turn children sitting, or people passing through, sometimes carrying children. It’s a short video, less than two minutes long and playing on a loop, and the effect is hypnotic and ghostly, as the animated lines move against the still gestures of the drawing. The other videos alternate on a monitor, an effect that pulls you in, where “Backyard’’ envelops you. “Monkey, Goat, and Trainer’’ retells a story by Sadeq Choubak, about a village entertainer who keeps his animals tethered, does tricks with them, and then dies. Khebrehzadeh takes her time, running thrice through a day’s cycle of tricks, then sleep, then rising, and the effect is sweetly lulling. The apparent simplicity of these works is deceptive. Some of the stories she borrows were, in their time, veiled critiques of social, political, and economic conditions in Iran. Khebrehzadeh’s shifting lines and her traces of facture act as a visual metaphor for the uncertain construction of memory. They look fragile. Yet her narratives are as layered and potent as dreams and memories can be.